Hello everyone! For today’s post, we’re featuring an idea from Evermine’s photographer, Bobby Pathammavong! Bobby always shares helpful wedding ideas, such as these tips for shooting your engagement photos or these ideas for bundled wedding invitations. 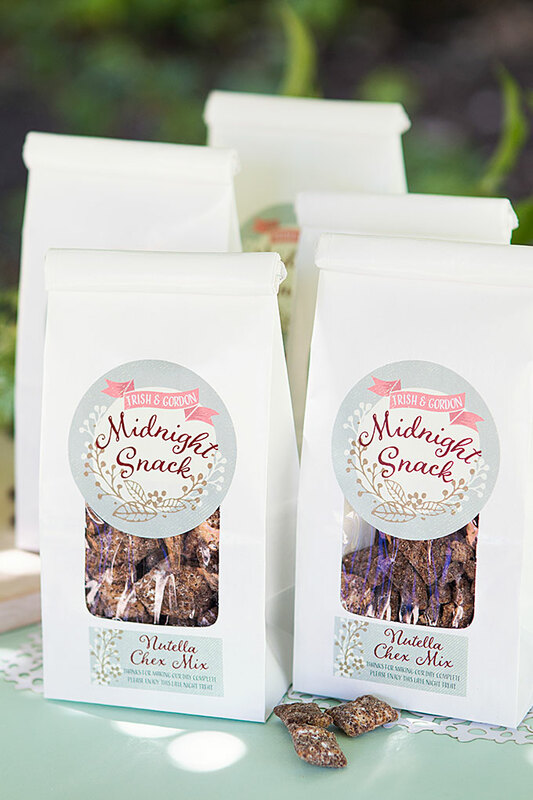 Today she’s sharing two midnight snack favor ideas for Wedding Favor Friday! Enjoy. Place your rice chex in a large bowl. Melt together chocolate chips, nutella and butter in the microwave. Heat for one minute, stopping to stir. Continue microwaving in increments of 20 seconds until the mixture is completely melted together. 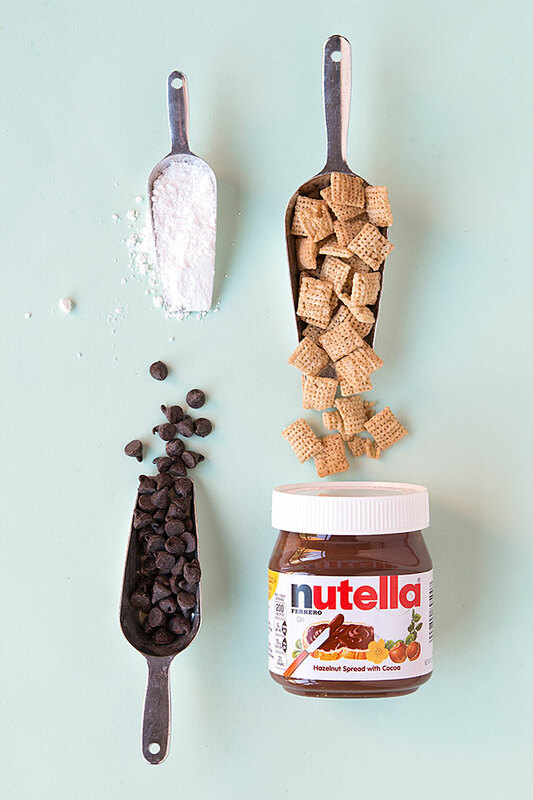 Pour your mixture over the rice chex and gently mix it around until it's evenly coated. Place the rice chex into a large Ziploc bag and coat with powdered sugar. Pour your Chex Mix onto s sheet of wax paper and let it set for about 20 mins. Finish by packaging the chex mix in small tin-tie bags. Who doesn’t like some donuts and milk for a late night snack? 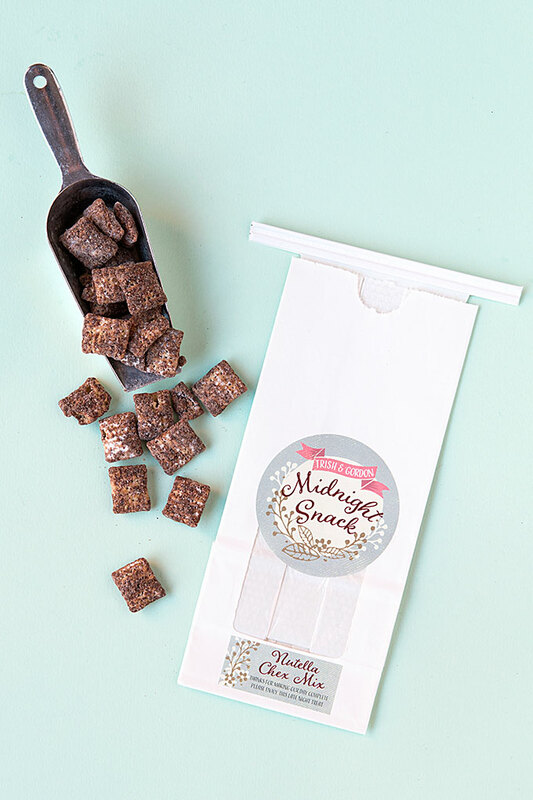 Your guests will appreciate this treat when they’ve got the munchies, and all it requires is putting some effort into the packaging. 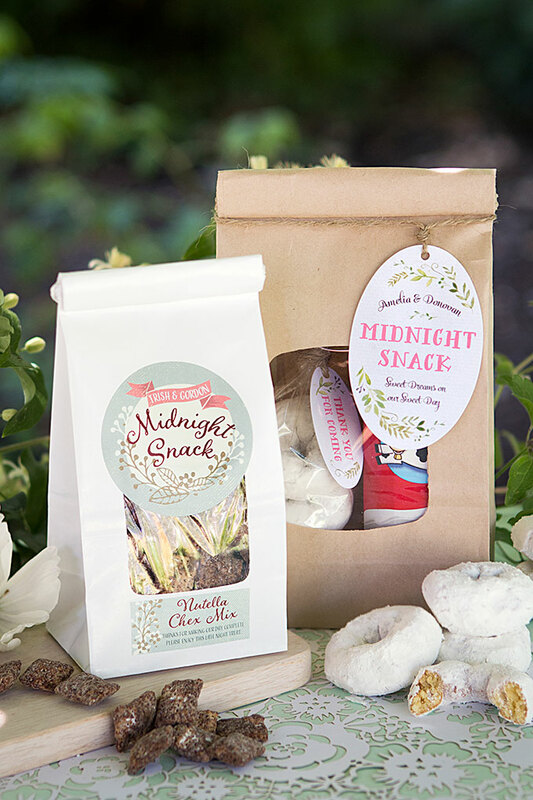 Pick up some of your favorite mini donuts (or cookies) and small servings of milk. 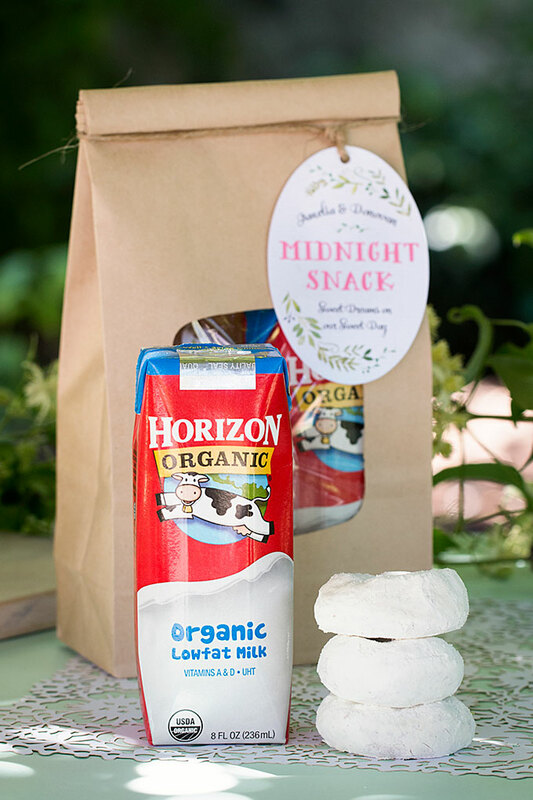 I chose to include shelf stable milk so these favors won’t require any refrigeration. 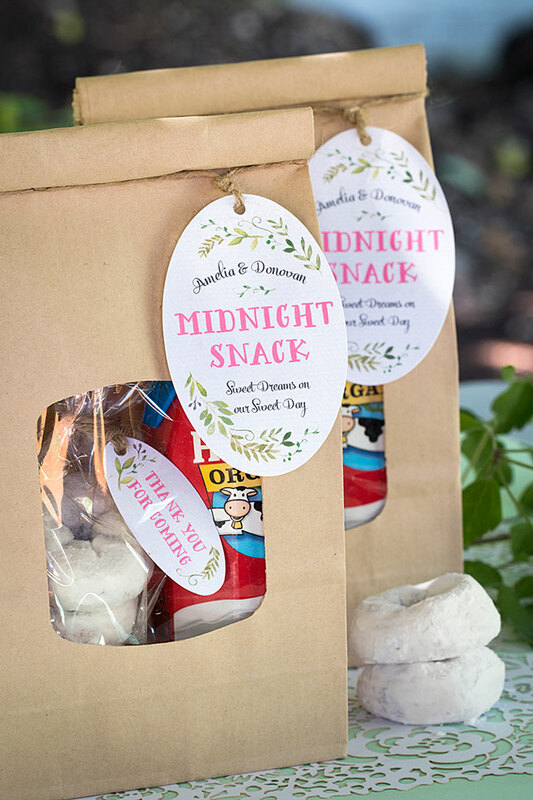 Package your donuts in small cellophane bags and tie off with a personalized favor tag. 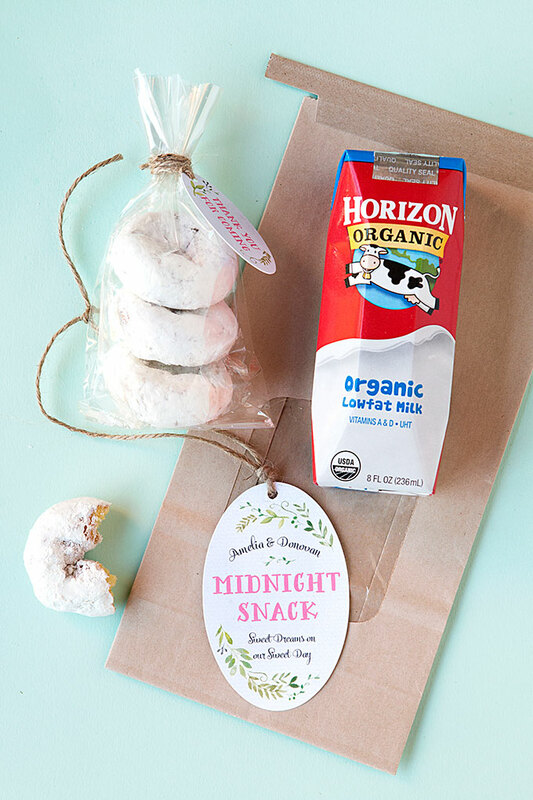 Place both your package of donuts and your milk inside a large tin-tie bag and use a large favor tag of the same style used on the donut packaging to complete the look! Small Window Tin-Tie bags • I chose the white color. Large Window Tin-Tie bags • I chose the kraft color. Circle Labels • I chose the “Spring Meadow” style in charcoal. Designer Address Labels • I chose the “Spring Meadow” style in charcoal. Oval Hang Tags • I chose the “Watercolor Spring” style in stone. Large Oval Hang Tags • I chose the “Watercolor Spring” style in stone.